John Rigby & Co. is a class operation all the way. No outfit captures the beauty and richness of the sporting life in quite the same way. 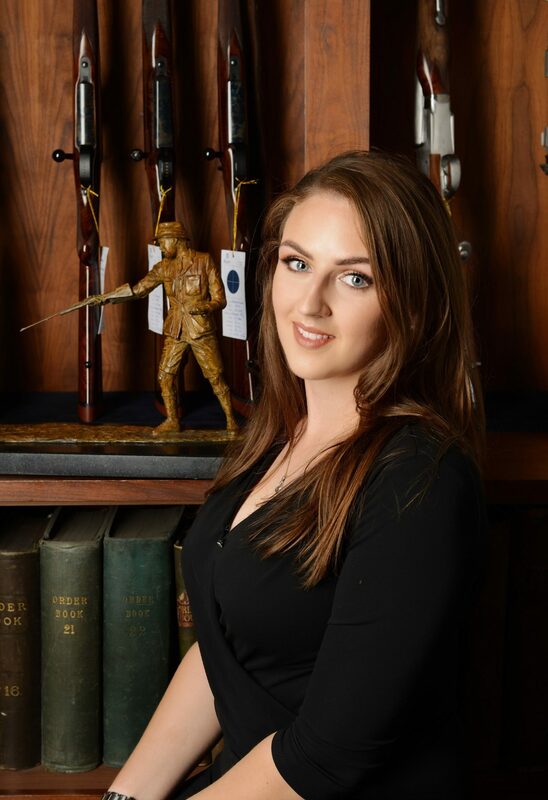 From their exquisite rifles to their leather goods, clothing and single-malt Scotch, Rigby just does it all — from field to lodge — the way it should be done. London gunmaker John Rigby & Co. has unveiled an exquisite, limited edition bronze sculpture of iconic hunter Jim Corbett. Artist Jenna Gearing was commissioned to depict a scene featuring Corbett, who most famously explored and conquered the Indian hunting scene, for the first in a series of ‘Rigby Heroes’. She created eight bronze sculptures and only two are still available to buy after six of them were pre-ordered by Rigby and Corbett enthusiasts. The sculpture reflects the Chowgarh Man-Eater oil painting by renowned wildlife and hunting artist David Southgate. 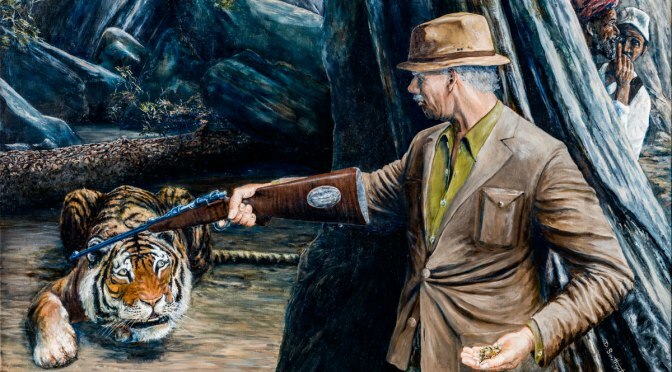 The painting, which was based on one of Corbett’s fascinating stories, shows the hunter aiming his .275 Rigby at one of the notorious man-eating tigers of Chowgarh. The story goes that the famous huntsman was within eight paces of with the killer animal after bending down to retrieve eggs on the ground. Following a successful confrontation, Corbett rendered the eggs lucky and returned them to their rightful nest. 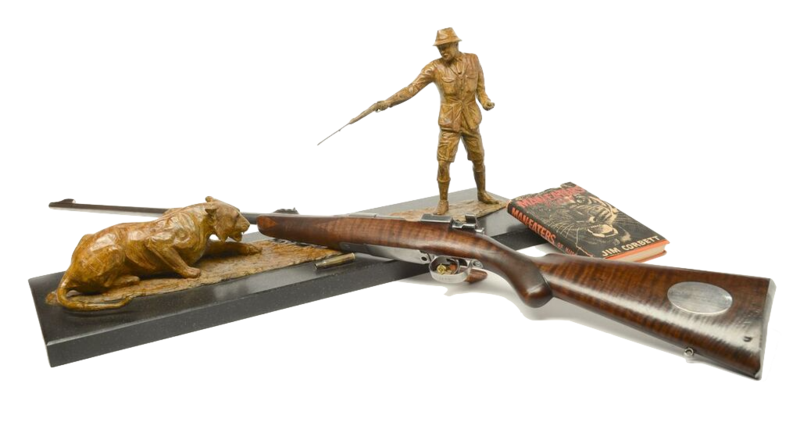 To commemorate the commissioning of the eight sculptures, Rigby shot the world-famous .275 Corbett rifle eight times before retiring it forever. Each bullet casing from these final eight shots has been placed at the front of the eight editions to signify the link between the rifle, the sculpture and Jim Corbett himself, highlighting the importance of his legacy and Rigby’s respect for the renowned hunter. Re: Gearing: This lovely and talented lass has made quite name for herself as a huntress as well as an artist. She makes about the best 21st Century ambassador of the sporting life one can imagine. Our way of walking in the world is under siege. Amid much that is troubling and dismaying, it is good to see class and beauty and a high standard of quality held forth as a beacon. Hats off to John Rigby & Co., Jenna Gearing, and one of the great ones, an exemplar of all a man ought to be: Jim Corbett. Previous Post: « Hail The Black Douglas! Ye Gods I think I’m in love LOL. Can’t afford the rifle. Can’t afford the sculpture. Damn sure can’t afford the woman. Still living in a world full of pretty things that’s free to look at, though. That’s gotta be worth something. Well, that’s the thing. “Existence value” is high. Save my name, email (and website) in this browser for the next time I comment (checkbox). NOTE: this allows the FP website to set a cookie to display a message that "your comment is awaiting moderation." If you do not check this box, your comment will be received and await moderation nonetheless.